“Get out of the silos and interact with users. It’s complex but refreshing!” - An overview of the Multi-Hazard Early Warning Conference and the 2017 Global Platform for Disaster Risk Reduction. 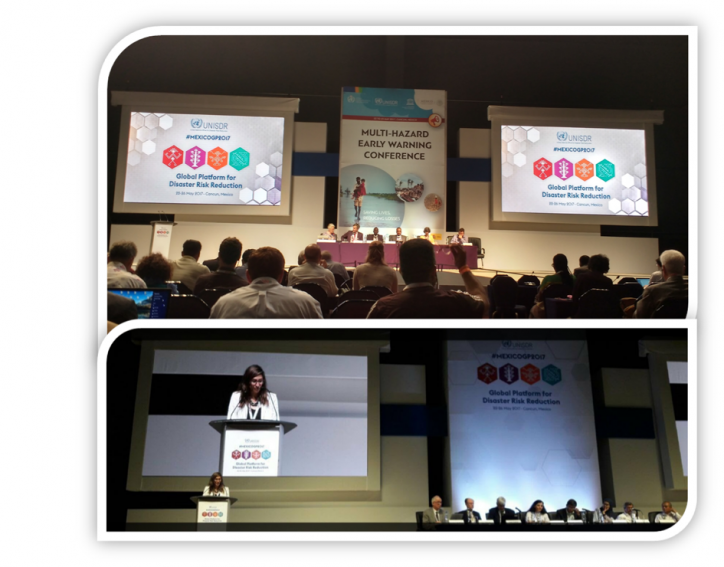 Hosted by the Government of Mexico in Cancún from 22 to 23 May 2017, the Multi-Hazard Early Warning Conference focused on how countries can improve the availability of and access to multiple hazards early warnings, risk information and assessments on potential interrelated effects of hazardous events. IMPREX was represented by Albrecht Weerts (Deltares) and myself (Gabriela Nobre, early career scientist [ECS] from the VU Amsterdam). Among several high-level speakers was Michael Staudinger, head of the Austrian meteorological institute, who presented MeteoAlarm - a platform that gets alerts from national weather services to the general public. He placed great emphasis on the need to overcome barriers in communication between developers and end-users, and to integrate multiple risks such as floods and heat waves. He also challenged us to “get out of the silos and interact with users. It’s complex but refreshing!” This fits very well with the IMPREX goal of providing risk outlooks which should focus largely on stakeholders’ needs. The conference also had a poster session, where some participants were invited to display their work. At this session, I presented my work on how climate variability can be applied as an early warning indicator of crop production, which can be downloaded from here. This work addresses themes such as impact-based forecasting, decision-making models and large-scale indices of climate variability aiming at strengthening European agricultural climate resilience. The Conference also served as a preparatory meeting for a Special Session on Early Warning at the 2017 Global Platform for Disaster Risk Reduction (GPDRR). At the GPDRR, held from 24 to 26 May 2017, I was engaged in the UN Major Group for Children and Youth (UN MGCY) delegation, as a young scientist working on Disaster Risk Reduction (DRR). The UN MGCY is the formal, General Assembly mandated and self-organised space for children and youth to contribute to and engage in certain intergovernmental and policy processes at the UN. During the working session on “Science and Technology to Achieving the 2020 Sendai Target”, I delivered, on behalf of the UN MGCY delegation, a commitment from the floor and launched the Youth Science-Policy Interface Publication on DRR. 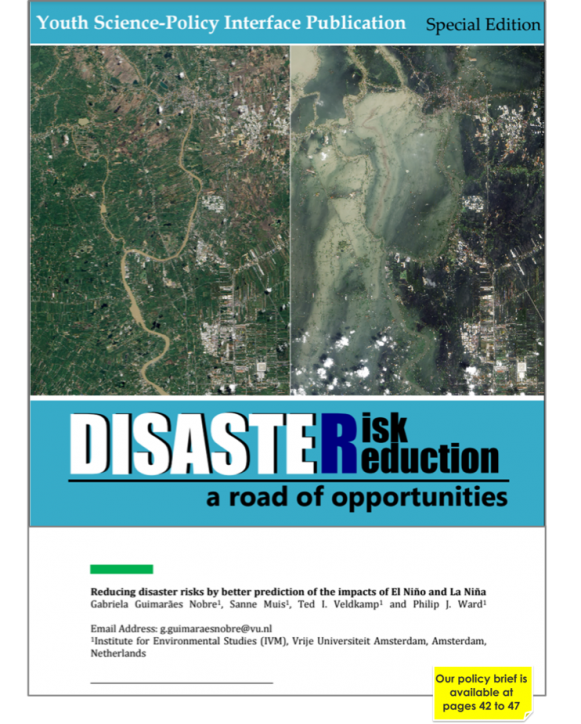 In this publication, we authored, together with some IVM colleagues, a policy brief on “Reducing disaster risk by better predictions of the impacts of El Niño and La Niña”. The GPDRR was the first opportunity for the international community to review global progress in the implementation of the Sendai Framework for DRR, and in particular the Seven Global Targets. To this end, many countries showcased action plans and strategies to reach the targets by 2020. As an ECS, I very much look forward to seeing how the tools, knowledge and risk outlooks produced by IMPREX can promote new ways of building linkages between science and policy components of such frameworks. Perhaps promoting people-centred outcomes and ensuring higher stakeholder engagement in the “first mile” could ensure that we reach the “last mile” by increasing the resilience of the European society as a whole. Figure 1: Multi-hazard early warning system 2017 speakers (on the top); commitment from the floor during the working session on “Science and Technology to Achieving the 2020 Sendai Target” at the GPDRR 2017 (on the bottom). Figure 2: The Youth Science-Policy Interface Publication on DRR launched at the GPDRR 2017, and our policy brief on “Reducing disaster risk by better predictions of the impacts of El Niño and La Niña”, which is available at page 42 of this publication. Can you handle the pressure? © 2015-2019 IMPREX. All rights reserved.